To battle obesity and improve students’ ability to concentrate, West Virginia Schools Superintendent Jorea Marple is campaigning for more minutes of physical activity in every child’s day. A Charleston Gazette video depicts the roving activity cart, which rolls a host of activities into schools rooms during the day at Wood County, West Virginia school. Click here for original Gazette layout with all photos and charts. 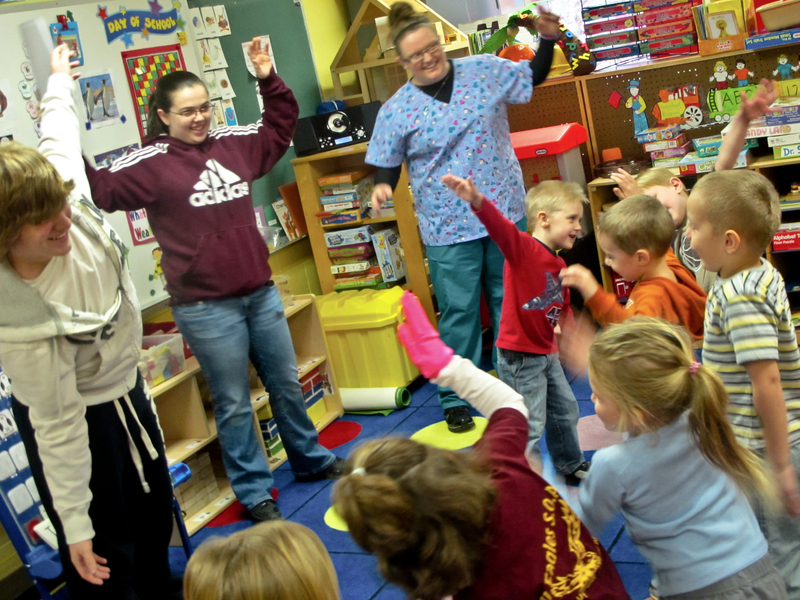 DIANA, W.Va. — Four Webster County High School seniors danced on the kindergarten rug. “Fly like an eagle!” they called, flapping their arms. Kindergartners flapped their wings. “Jump like you’re popcorn popping! Run from a growling bear! Slither like worms! Sway like a tree in a windstorm!” The Diana Elementary kindergartners jumped, learning vocabulary as they slithered and swayed. The older students slithered and swayed too. They’d come to promote a new campaign to get kids up and moving through the school day. Since September, Marple’s staff has crisscrossed the state, putting on more than 125 “Let’s Move! West Virginia” demonstrations. They haven’t reached all schools yet. “It sounds good, but I never heard of it,” a Kenna Elementary teacher said last week. 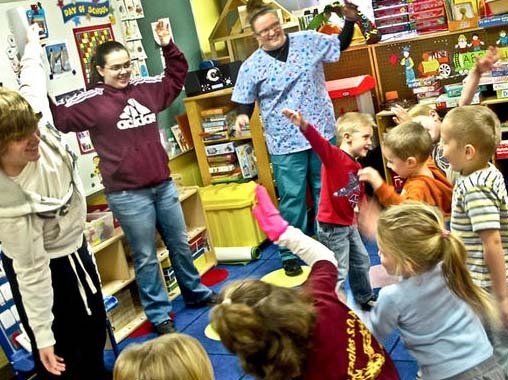 “It’s taught me how important exercise is, how it helps kids pay attention, stay healthy, and avoid things like diabetes,” said Ashley Short, who plans to be a nurse. At Diana Elementary, they played a quick, aerobic round of rock, scissors, paper with the fifth-graders, then the kids sat back down smiling, faces flushed. Above all, Superintendent Marple wants to limit chair time — children sitting for hours. They are also more likely to gain weight and have high blood pressure or cholesterol. “We’d like to see younger kids up and moving every 20 minutes,” Marple said. Soon after she took office, Marple cancelled rigid requirements that dictated the exact number of minutes teachers must spend on each subject. “If students are excited, I don’t want them to have to cut a lesson off because the time’s up,” she said. “Kids are happier when they get to move,” she said. It can positively change a school’s culture, she said. Marple hopes eventually to lower the obesity rate. In 2010-11, 18 percent of kindergartners and 23 percent of second-graders came to school obese. One in four fifth-graders had high blood pressure and red-flag cholesterol levels, and one in four was obese, according to measurements by West Virginia University. Obese children are at higher risk of future heart disease, diabetes, stroke and other problems. By the end of January, about 109 elementary and middle schools had signed on to Marple’s “Let’s Move! West Virginia” campaign. There are already at least 130 West Virginia schools in the national Healthy Schools Network, aimed at increasing physical activity and good nutrition in schools. Mary Weikle is in charge of the “Let’s Move! West Virginia” campaign. Fifteen minutes is not enough, but it’s important to start with something that’s easily possible for a classroom teacher, she says. This entry was posted in School efforts to lower the numbers, Stories about community programs, Stories that illustrate research, Video and tagged Video. Bookmark the permalink.